One of the bulbs in the dome light of [Pete’s] car burnt out. These were a bit hard to get at for replacement so he thought he’d try something that would last longer, and have no problem standing up to the vibrations that go along with automotive electronics. But plug-in LED replacements cost more money than he was willing to spend. 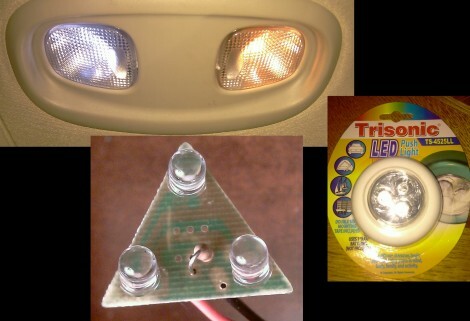 Luckily there was a dollar store next door to the auto part shop, so he bought three LED touch lights for the dome and cargo bulbs. After cracking them open he found that the LEDs were wired in parallel. He needed to put these in series in order to take advantage of the voltage drop. After de-soldering the bulbs he measured the characteristics of one, then calculated the voltage drop and resistor value using a worst case scenario of 14V to avoid damage to the light when the engine is revving high. From there he cut the traces on the board and rewired them. The reworked module fits nicely and as you can see in the image, gives a more pleasing light color than the orange of the stock bulb. they have any shape and size bulb for most 12v car bulbs. look in your manual which bulb sizes go where and you’re good to go. theres no real reason to have to hack a touch light. or am i missing the whole thing of where older cars don’t have bulb lighting for interior? You can get LED bulbs in most auto stores for $3-$15 depending on size. Superbrightleds.com was mentioned on his blog (a few comments down). He says his bulbs were $15 each to buy, where as this was $3. That said, I worry about the intensity and throw of most LED lamps as the light tends to drop off quickly. I did a similar thing when one of my license plate lights went out – except i just grabbed 6 white led’s from my stash of cheapo eBay LED’s and a suitable current limiting resistor, then soldered them to the old bulb’s base. I considered superbrightleds or similar sites, but considering this cost me just a few pennies in components and maybe 15 mins of work, i thought it was a much better solution! More shockingly, it has already lasted through the first half of this wisconsin winter! I’ve replaced LEDs in many things that were using light bulbs before. To those claiming it is too much work, it is not. It is a pretty quick thing to do and easier than ordering or going out to buy a replacement bulb (or LED equivalent); I do keep stock of white and other color LEDs though. Proper limiting resistor will ensure you don’t have to replace them again…ever (they’ll outlast the car) and I do like the “fluorescent white” better than the yellowish/orange of car bulbs. Wow, I am literally in the process of doing the exact same thing to my dome lights in my car. I even have those same lights that I ripped apart, although mine were bought last year after christmas for 90% off. Dealextreme also carries LED replacements for my car (1984 mercedes diesel) you just have to match the length of the bulb to the one you are replacing. However, after looking at the state of 26 year old electrical connections on my car, I’m mostly changing everything over to LED as it burns out. I just finished the dash lights. I don’t have the write-up on my blog yet though. Soon. Next are the visor lights and new mirrors. The standard voltage when the car is running is between 13.5 and 14.5vdc. Using 14v as a safe bet seems a bit low. I’m curious to know what the high voltage rating of the commercial led from superbright are rated at. Over voltage really cuts down the life of leds. I’m willing to bet those dollar store LED’s aren’t as bright as the stock incandescent bulb. The problem I see with rating the current limiting resistor for the max. surge voltage on the car 12 VDC supply is that the LEDs will visibly dim when the voltage drops lower and will brighten when voltage surges. I have thought this type of super-simple, super-cheap current regulation would be very useful for arrays of high-power LEDs. I’d appreciate any other thoughts from anyone who’s used this or any other low-cost (i.e. less than US$0.30) constant current source before. BTW, the reason I would want a super-cheap current source for arrays of high-power LEDs is that each LED might be individually controllable and must have its own dedicated current source. @Bill, that’s probably true, but if you accidentally left the inside lights on overnight they won’t drain the battery like incandescent bulbs do. Ah yes, another genius suggesting a bought alternative on the hack site. i did this a year ago in my celica. bought one of those 40 smdLED squares from autozone and hacked it in on my lunchbreak. old bulb used to barely light the floor in the front seats. now i can totally see the back my trunk when the seats are down. Plan on putting some with audio sensors in my speaker housings. ^Pics or you didn’t hack it. you can find some awesome stuff to hack at the dollar tree, sometimes. all other ‘dollar stores’ FAIL, in my experiences. A store shouldn’t be legally allowed to use the word ‘Dollar’ in the name, unless prices truly don’t exceed a dollar. That is why the Dollar Tree wins. plus the awesome things i have gotten there: Walkie talkies, CFL’s.. (both of which i cannot find anymore) FM radios (which i do not understand, being a few coils, an LED and a few other small things.. All kinds of USB crap.. one thing i never got around to buying because it seemed pointless was the USB LED booklight or whatever it was.. but my favorite is Arizona Green Tea. 99% of the time, that is the original reason that I walked into the store. Walkie talkies were the best hacking experience, although the Dollar CFL would have likely yielded some interesting circuitry, had it not mysteriously vanished before i got the chance to see it break/dissassemble it. The other thing that i found at the tree was a dollar universal remote, which pwned the expensive remotes, until i sat on it.. all i remember being inside were the printed-type button contacts, the black blob, an IR and a red LED. if only Dealextreme would supply Dollar tree with the sub $1 stuff, then i would be happy to pay $1 for it, because instant gratification, no wait. and it’s dollar tree, you expect cheap foreign-built crap. I disagree about the light. I find it harder to “see” under white LED light than the warm yellow of a regular bulb. Much prefer those instead. Thats because your eyes adjust to yellowish-red light better than bright white or blue lights. One of the reasons why street lamps are usually orange. It also helps keep bug problems down as well. @ Jeditalian: Dollar store stocked by DX? @Sariel – that has nothing to do with why street lamps are orange. The reason street lamps are orange is because that’s the only color available from low pressure sodium lamps. Low pressure sodium lamps are used because they are one of, if not the most energy efficient light sources available (100-200 lumens/watt, much higher than nearly all LEDs which are just hitting 100 these days), and manage to provide that efficiency at low cost. Nominally no, the “orange” most commonly used in North America is the high-pressure sodium lamp. Low-pressure sodium is used in a few places but generally since it only emits that one color–not pure orange but a orangish-yellow, it produces no color rendition under it (unless you have a fluorescent color). It certainly is the most efficient light source out there but at great cost to color rendition, which is why increasing the pressure to broaden the sodium lines out to red-yellow in the HPS lamp is the way to go for the best combo of color rendition/efficiency. For @Sariel, the color choice on streetlamps is completely municipally decided and often may be from decades-old issues unrelated to human vision. If it’s new development, it’s usually orange HPS, or perhaps blue-white metal-halide. If it’s older, it could still be mercury-vapor. It is true that bluer lights are scattered more in the eye and cause more problems for human vision than warmer lights. It’s one reason why we need to point out replacing efficient HPS — “orange” lights — with blueish white LEDs is a bad idea. It’s less efficient, will cost more, and will create more light pollution and human vision difficulties (if compared with identical streetlamp systems). If white LEDs are demanded, at least use a warmer white LED with a color temperature matching incandescent 3300K. They are much nicer looking for most applications (excepting when you want daylight inside).